For a month, we focus on bug triaging to get our bug tracker in a better shape. Maintainers then get a clearer picture of the state of their module, users have a better chance to see their issues resolved, and software quality improves as a consequence. We are holding several bug squashing parties throughout the month, so hop in and we'll show you the ropes! If you're new to GNOME, this is a great way to get your feet wet, meet fellow community members, and learn how you can start contributing. On those days, members of the Bugsquad will be around to mentor you and guide you through the bug triage process. You are of course welcome to join the channel any other day too. 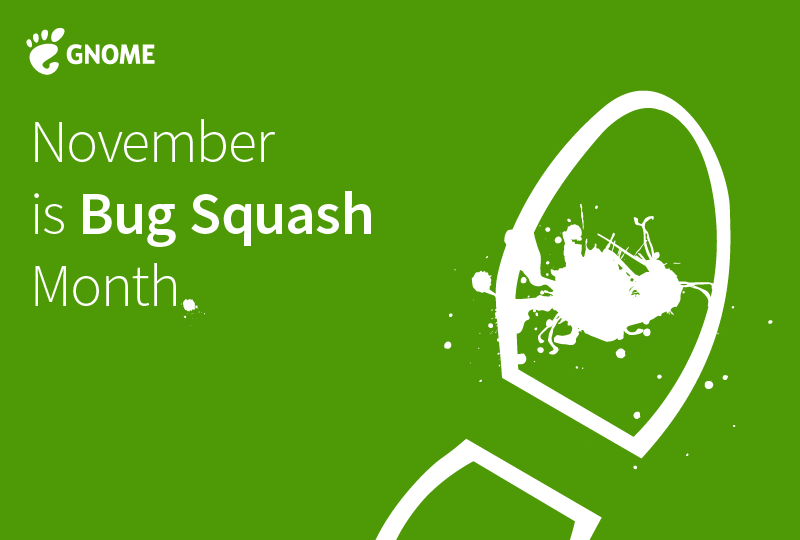 Feel free to use the Bug Squash Month graphics to help us announce this initiative! Please post pictures of yourself squashing bugs (be as creative as you'd like), on social media with the hashtags #GNOME #BugSquash. If you have a group of free software enthusiasts in your area you can organize a BSP with them, or you can join an existing one! You don't necessarily need to stick to those times for your bug hunts. Bugs are wild animals that can be chased at anytime of the day and year.